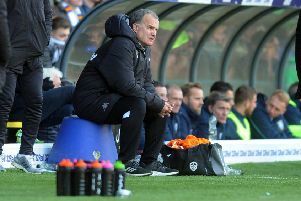 Despite missing a host of chances Leeds United were back to winning ways with a 2-1 success against Bolton Wanderers in front of a season’s best crowd at Elland Road. A bumper crowd of 35,377 saw the Whites dominate apart from a four-minute spell in the second half, but they made hard work of finally clinching the deserved three points. It was, however, a more encouraging display for head coach Paul Heckingbottom, for who this was only his second win since he took over. Leeds made a lightning start and it paid off as they took the lead in the fourth minute. They had already had a good chance before then when Ekuban did well to intercept a short back pass by Andrew Taylor and played the ball to Ezgjan Alioski, who then curled a shot wide of the far post. But in the fourth minute a cross was only half-cleared and the ball invitingly for Ekuban who found the net with a volley from 12 yards out to score his first league goal in Leeds colours. The game settled down more after this with Bolton having a chance, Jan Kirchoff heading over from a corner. Pierre-Michel Lasogga put a volley on the stretch wide after meeting Alioski’s cross at the other end, but the early thrills subsided and goalmouth action was more at a premium for the rest of the half. Alioski did race through on 35 minutes, onto a long clearance by Pablo Hernandez, but with just the keeper to beat he fired just wide. Lasogga sent a header wide of an open goal after Bolton stopper Ben Alnwick had failed to meet a corner. Leeds still had the better of the play with Pontus Jansson unlucky to see his header from another corner smack off the crossbar. The Whites started the second half like they had the first as Hernandez was set up nicely on the edge of the box and saw his low shot well saved by Alnwick. Lasogga sent a volley over in a crowded box from a corner before second goal arrived on 50 minutes. Vieira’s fantastic long range pass out to the wing was equally well controlled on the chest by Alioski before he cut inside to lash a shot that was acrobatically saved by Alnwick. The rebound fell to Hernandez, however, and he bundled the ball in from close range. Suddenly they were all over Leeds and the home team looked briefly to fall apart. Ameobi’s shot from the edge of the box was only just wide and Will Buckley then sneaked in at the far post only to see his diving header go wide. United did get their control back, however, after this dodgy spell and they should have had the game comfortably won well before the final whistle. Ekuban raced onto a through ball from Hernandez only to see his shot saved by Alnwick’s feet. Jansson then headed over from another dangerous Hernandez corner. Ekuban had another great opportunity to add his second goal in the 89th minute when he was clean through, but again he failed to beat Alnwick in a one-on-one with the keeper. It did not matter in the end as Leeds saw out the remainder of the game to pick up the three points. Head coach Heckingbottom was in no doubt that Leeds deserved their victory. He said: “I’m delighted with the win and the three points and it was deserved. “Both halves we started well and it’s something we’ve been stressing all week. They are difficult to play against and are a really competitive side and really well organised. “There were definitely a lot of chances we should have put away, but we’ve won and I’ve got to be complimentary about the way we defended because Bailey only had two bits of work. Heckingbottom reported that were no new injuries ahead of the Fulham game on Tuesday, although defender Liam Cooper will still be out after a thigh injury showed up in training and will mean he is out for the next couple of games at least. Forward Kemar Roofe is close to a return and could come back into contention. Leeds: Peacock-Farrell, Dallas, Jansson, Pennington, Berardi, Alioski (Grot 83), Vieira, O’Kane, Hernandez, Lasogga (Saiz 62), Ekuban. Bolton: Alnwick, Flanagan, Beevers, Burke, Taylor (Clough 88), Ameobi, Kirchoff (Wilbraham 74), Prieto, Vela, Buckley (Morais 66), Le Fondre.